Beginning in the 1880s, political economists, sociologists, psychologists, political scientists, and philosophers turned, in slowly growing numbers, toward communication as a term, idea, and set of social and psychological processes. In the U.S., Progressive Era (1890s-1920s) thinkers like Charles Horton Cooley, John Dewey, George Herbert Mead, and Mary Follett wrote about face-to-face and larger-scale public forms of communication, which they argued were important elements of a well-functioning democracy, and vehicles for reform and social progress. Early research focused on newspapers, books, and conversation, but by the late 1920s newer media like motion pictures and broadcast radio were receiving attention as well. World War I (1914-1919) catalyzed scholarly and public attention to propaganda, which all the major powers mobilized in their war efforts. To some observers in the 1920s and ‘30s, propaganda seemed to be everywhere, ranging from governmental appeals to commercial advertising, public relations, education, and religion. In the late 1920s, talking movies and national radio networks came on the scene and by the 1930s both had entered their golden eras. Empirical research on both began to appear, led by the important Payne Fund Studies (conducted 1929-1932) on motion pictures. Studies of radio began appearing in both Europe and America, driven by a blend of scholarly, commercial, and political motives, and with differing philosophical orientations. Advertisers, marketers, educators, government agencies, social scientists, and humanist intellectuals were all interested in understanding how new and older media were changing modern life and determining the uses to which they might be put. The work that emerged in the 1930s was a cross-disciplinary blend of sociology, psychology, political science, literary criticism, philosophy, journalism, anthropology, library science, and marketing. It addressed topics ranging from the impact of radio on democracy and human minds to the practical effectiveness of a broadcast education program or advertising campaign. “Mass communication” appeared as a term in public discourse in the 1920s and by the 1940s was naming a new field of study: mass communication research. It came together as a consequence of an influential Rockefeller Foundation seminar, government-related wartime propaganda research, commercial funding from radio and other media industries, and the intellectual efforts of scholars affiliated with a number of American universities—especially Columbia, Yale, the University of Chicago, and several Midwestern state universities. World War II was a major impetus in the development of the field as the federal government enlisted social scientists to study the effectiveness of their domestic and overseas propaganda efforts. 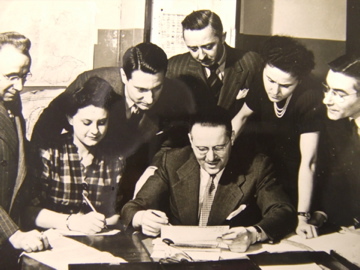 Among the major players were several that the women of the film worked with: Columbia’s Bureau of Applied Social Research (sometimes called ‘the Bureau’), known before 1944 as the Office of Radio Research (ORR), and led by the intellectual triumvirate of Paul Lazarsfeld, Herta Herzog, and Robert K. Merton; and the federal government’s Office of War Information (OWI); Office of Strategic Services (OSS); Voice of America (VOA); and the Department of Agriculture’s Division of Program Surveys [EXT. HYPERLINK]. After the bombing of Pearl Harbor in December 1941, millions of men and women joined the military, and thousands more took civilian jobs connected directly to the war effort. Some women went overseas as WACs or WAVEs while others worked stateside in government agencies or war-related industries. The image of “Rosie the Riveter” captured one among many jobs women did while the men were overseas. Instead of factories, the women in the film worked in propaganda and media research. Thelma Anderson, Thelma McCormack, and Joan Goldhamer all did this in a civilian capacity at the ORR and Bureau. Yole Sills worked at the VOA where she and other women wrote scripts and helped produce English and foreign-language propaganda. Gladys Lang conducted research for the OWI and OSS, analyzing radio soap operas and foreign newspapers to determine how they were addressing strategic topics. As a new and relatively low-status field, communication had more room than other, better established disciplines for women and some minorities. Women and Jews (who faced serious discrimination in the U.S. at the time) both made key contributions to the development of the field and were central players at Columbia and to a somewhat lesser extent, the University of Chicago. Columbia and the University of Chicago represented the two greatest intellectual centers for communication study in North America from the 1920s through the early 1950s and as such provided some opportunities, although even these were still limited. Out of the Question focuses primarily on Columbia, though Gladys Lang talks about experience at Chicago, too (where, incidentally, she worked with Helen McGill Hughes, a Chicago Ph.D student who had published a major study of newspaper human interest stories in 1940 but was working in a kind of institutional limbo as an editorial assistant). After World War II, the men returned to civilian life,and opportunities for women vanished. Work dried up for them at the Bureau, where male graduate students were given priority for research positions. A number of women went to work for New York advertising agencies where they introduced research methods like the focused group interview and terminology like ‘public image’ that had been developed through work done at Columbia. Across the country, female graduates with degrees in hand, including those studying media, rarely found good tenure-track jobs—a situation that would continue for several decades. At this point however, the field of communication was separating off from its parent disciplines and striving to establish itself through new departments and scholarly organizations. Wilbur Schramm, working at the University of Illinois and then Stanford, became the most influential American shaping the course of the field and linking it to Cold War politics and funding sources. Meanwhile, much of the most exciting thinking about media and communication in the 1950s and ‘60s took shape outside the U.S.—from Harold Innis and Marshall McLuhan in Canada, Roland Barthes in France, Richard Hoggart and Raymond Williams in Great Britain, and Jürgen Habermas in Germany. By the 1970s, women were finally entering the professorial ranks in growing numbers, and as a result communication and media studies were infused with new energy and critical sensibilities. Women like Gladys Lang and Thelma McCormack at long last secured tenure-track position, while younger scholars like Gaye Tuchman brought fresh feminist perspectives to bear on understanding and criticizing mass media. Lazarsfeld and the Bureau came to be criticized as scholars turned toward critical, cultural, or more robustly historical approaches to interpreting the media. Both the intellectual diversity and presence of women scholars in the field continued to expand in the 1980s and ‘90s, while simultaneously communication grew as a field and established increasing presence outside the United States. 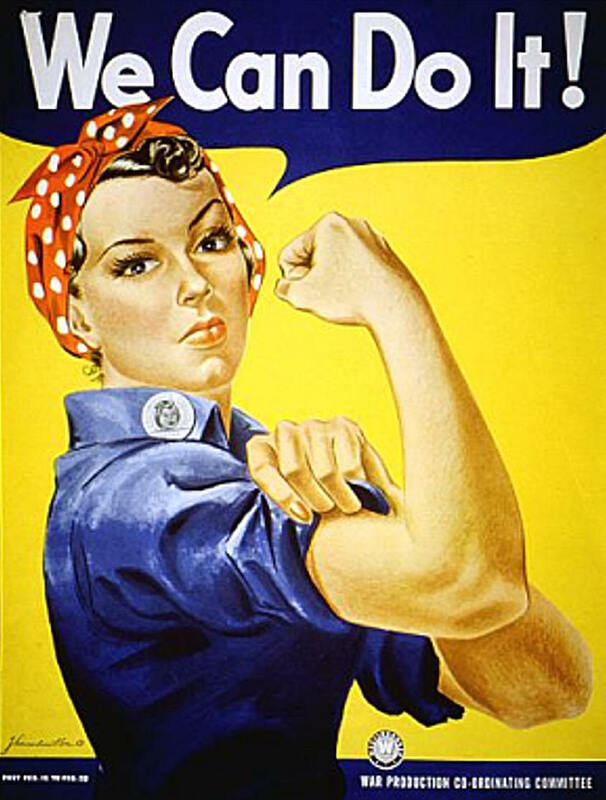 Click here for more information on Women during WWII.